The political chaos and unrest in Libya is taking a serious toll on health services, with the departure of medical staff and humanitarian agencies increasing the strain on health workers seeking to treat those injured in the clashes taking place since June. Several aid and UN agencies have reduced staffing levels. The International Committee of the Red Cross (ICRC) moved international staff to neighbouring Tunisia, though national staff in Libya continue to work on the ground. On 28 August five newly equipped ambulances were hijacked and stolen. The Ministry of Health fears a “total collapse” of its health care if foreign medical staff leave Libya in large numbers, according to a spokesman. Sixty percent of hospital staff are from the Philippines and 20 percent from India. “The departure of foreign medical staff and shortages in medical supplies has rendered the plight of civilians more critical,” Tarek Mitri, the UN special representative of the Secretary-General in Libya, told the UN Security Council on 27 August. More than 3,500 overseas Filipino workers (OFWs) out of an estimated 13,000 OFWs have been pulled out of Libya, according to a statement from the Labour Secretary of the Philippines, released on 28 August. It is not clear how many of the 3,000 OFWs working as medical staff are among the departed. She said the community was particularly worried after a Filipino nurse was raped in Tripoli at the end of July. The main motive for the foreigners to stay is money; a Filipino nurse often earns twice or three times more, about 920 LYD (US$751) a month, than they could in their country. TCH is under the protection of national police units but staff say they do not feel so comfortable. “When bad guys are coming inside the hospital with guns, the policemen often leave,” Ahmed*, a Libyan medical staff member, told IRIN. A non-exploded rocket, which fell in the hospital grounds but did not explode, has been cordoned off by tape but not removed since it fell two weeks ago. Some health centres are inaccessible. The Al Jala hospital in Benghazi, the main centre for trauma care, is closed, and another major hospital, Al Hawwary, is inaccessible because it is in an area where fighting is taking place. The situation is similar in Tripoli. “The emergency rooms in Tripoli Medical Center, Central Hospital and Abusleem Hospitals are barely functioning,” according to WHO. Abduljalil Graibi, director of TCH, has moved his office to the surgery department to provide support to staff in the current crisis. He estimates that around 15 percent of his foreign medial staff have left, something he says is having a big impact. “When the foreigners are on duty, I know that I can rely on them, whereas the Libyans can walk away from the hospital at any time.” He says working rules are harder to enforce since the revolution. The departure of foreign medical staff happened mainly during Ramadan when the number of patients is normally low. The lack of fuel and the heavy fighting in Tripoli suburbs have also made people less able to come into hospital. To cope, hospitals has instituted longer working hours. “Libya should salute the foreigner medical staff, even those who decided to leave,” Fawzi Azowai, head of international relations for the Libyan Red Crescent and a trauma orthopaedic surgeon at Mitiga hospital in Tripoli, told IRIN. The hospital is near an Islamist brigade base. The fighters have agreed to help the hospital: They provide fuel for the generator and secure the buildings. “We remain neutral in the fighting. Fighters from any groups can come to be treated,” said Azowai. If the lack of staff is a challenge, the shortage of medical supplies is a bigger concern. The only organ transplantation programme in Libya has closed its 25-bed hospitalization unit in order to send nurses to more urgent services. Transplants are not possible for the moment because of a lack of medicine. A rocket landed in the grounds of Tripoli Central Hospital, though without exploding. 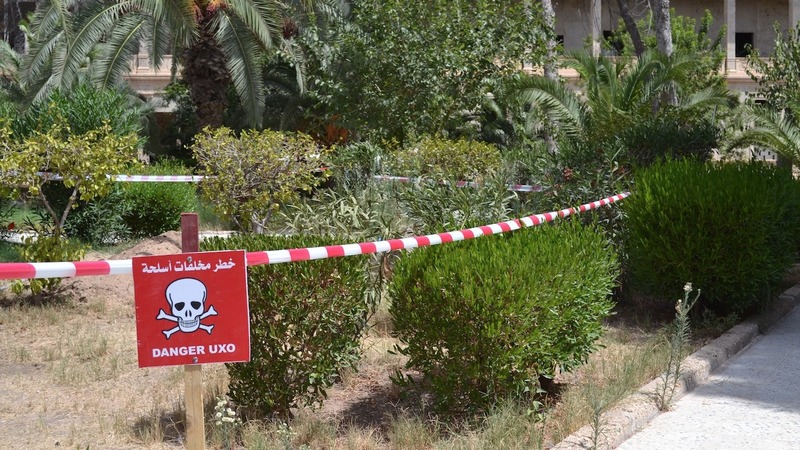 The UXO has yet to be cleared, creating a hazard for patients. Four patients have already rejected their kidney transplant. “Our drug storage is empty. For example, we need monthly 15,000 caps of Neoral-100mg which is used to prevent organ rejection in people who have received a transplant,” said Mohamed Harisha, an anaesthetist from the organ transplant centre. Most of the medication warehouses in Tripoli are along the airport road or in the Ben Gashir area, south of the city. This has been the location of the heaviest fighting between armed groups fighting for control of the capital. After the victory of Misrata and Islamist brigades over Zintan-linked brigades, the clashes are more sporadic but state drugs warehouses in Tripoli and Benghazi have been heavily looted. The closure of Libyan air space and the difficulties of reaching Tripoli by road from Tunisia make getting fresh supplies extremely difficult. “For basic equipment or drugs, we have stock for months but for specific needs, it is less,” said Khalifa Gaddur, director of Mitiga hospital in Tripoli. “We treated around 400 injured patients during Ramadan, most of them fighters. Last year, there were only 50 patients,” he said. Adulkarim Fallah, head of the laboratory unit, knows he will wait for weeks for the spares he ordered (due to arrive by ship) from the Middle-East. “We have to work like there is no Ministry of Health,” Azowai told IRIN. The government resigned on 28 August. Two rival legislative assemblies are currently claiming the right to appoint the executive. Misrata and Islamist brigades, which gained control of Tripoli after five weeks of clashes, support the General National Congress (GNC) elected in July 2012. The Zintan brigades and the armed group run by the former general, Khalifa Haftar, which is fighting Islamist groups in Benghazi, back the House of Representatives, elected in June to replace the GNC and currently located in Tobruk, in the east. The political feud could again delay the 2014 budget. Some medical staff have not be paid for six months. “Medicine is a humanitarian job but we need a new strong health system to work properly,” said Azowai.